For one week, I decided to stay at home and do all unfinished business – from websites, blogs and other training prezo that I need to do. Almost all were accomplished but still I need a some sort of a break and then to perk up my gusto to work. 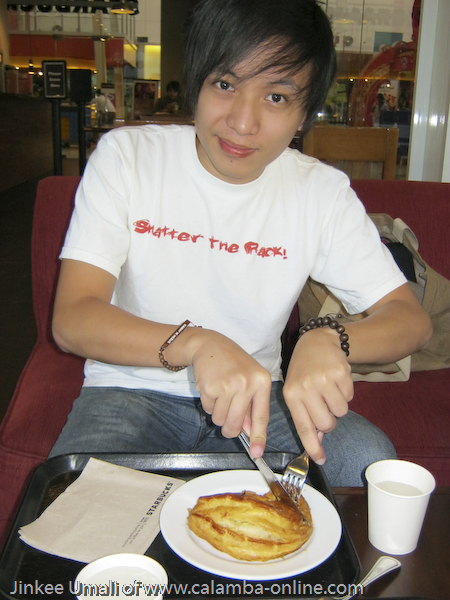 One thing for sure, I miss the metro, the coffee and the malls even it was crowded and was traffic. What I did this morning was to headed my way to the mall, SM Calamba. With me were my laptop, camera , planner and my notebook where I can still work. When my son knew I will be going to Starbucks, he joined me and got breakfast. We were there at Starbucks before they opened at 9am and even the mall was still closed. 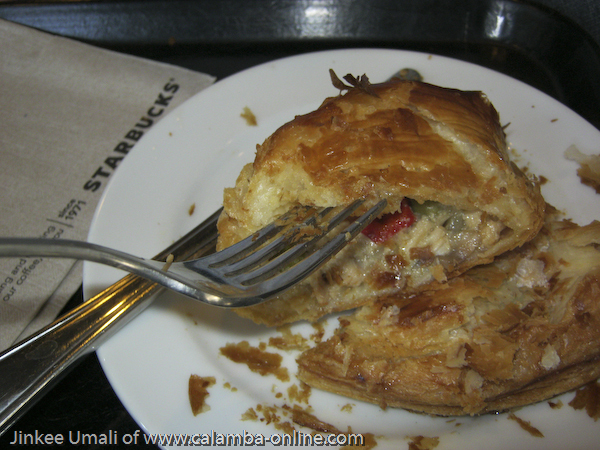 What caught me in the eye at Starbucks’ pastry bar was the Guilt Free Indulgence and for Raf, the huge Chicken Empanada. The crew even recommended me the Guilt-Free Indulgence. 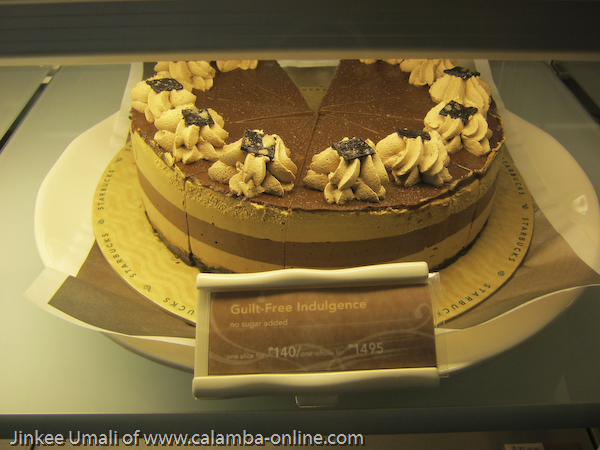 It is sugar-free chocolate cake layered with three different types of chocolate mousse – white, dark and mocha. 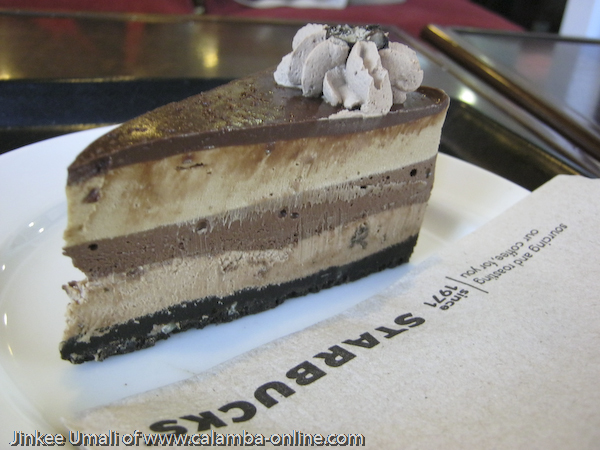 The crust below was coated with dark chocolate. 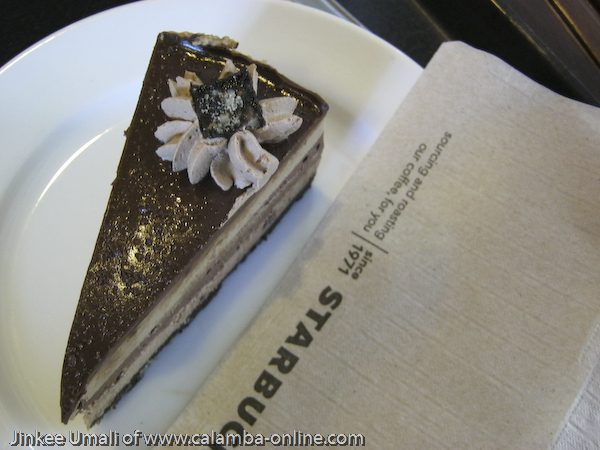 Very sinful, I may say – smooth and light! Great for those people who are diabetic. Price is P 140.00. While the Chicken Empanada, which is great when eaten heated got this puffy pastry and mixture of carrots, peas, potatoes, bell peppers and chicken strips. Quite huge as you can see but not that heavy breakfast for Raf. According to Raf, he will settle for their sandwiches like Tuna Waldorf on Raisin Walnut Bread Roasted Chicken Pesto and Shiitake Mushroom on Flat Bread which for him are really breakfast con lunch in one which he tried when we were in Alabang Town Center. Price is P 70.00. After Raf finished his breakfast, he left me and went to school while me, still working inside and hooked up to mall’s wifi. 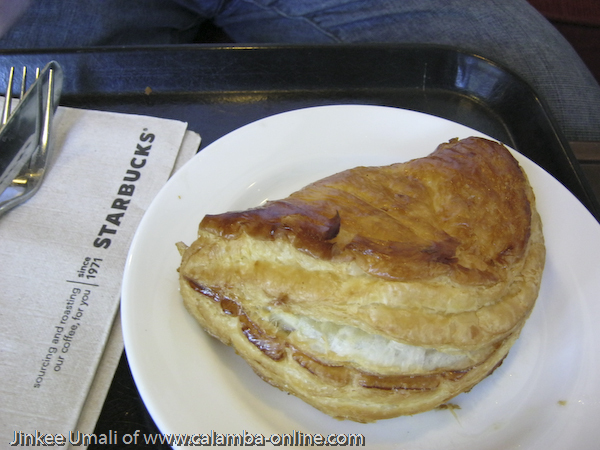 Great to went here at Starbucks this early where one can see the ambiance of doing and planning silently alone. Even I still love to do these stuffs to my home office, sometimes we need some sort of changing our work environment. Effective for me as I was productive for two to three hours while ideas keep on coming especially now that I am planning for greater blast for Calamba-Online like blog make-over as in new look, contests, giveaways but most especially posts with lot of meaty information…So let’s get it on for 2012!